Home > Address Plaques > Address Signs > Oval 2 Line Brass Plaque For Address, Business Name, House Name, Room Number etc. 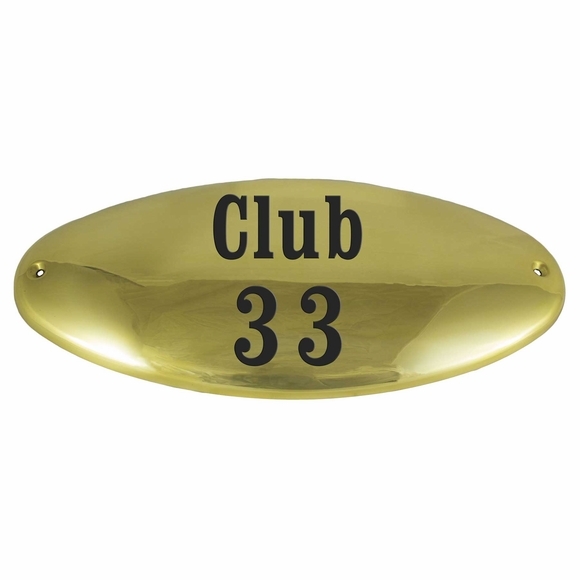 Oval 2 Line Address Plaque holds the address number and street name or the club, business, or house name you supply. Polished brass 10.75" x 5.125" personalized wall sign. Four engraving (font) styles: clarendon (shown above), old english, optima, and script. Small image contains a sample of each engraving style. 10.75" x 5.125" polished brass address plaque.